Psyllium fiber in a smoothie? Isn't psyllium husks something you take for irregularity? Psyllium husk powder is a well-known aid for irregularity, but ground psyllium husks added to smoothies do more than just provide fiber. They also regulate appetite and fat absorption in ways that make smoothies diet food. Just about everyone is familiar with psyllium husks as a remedy for constipation. The fibers in psyllium absorb water and add bulk to stool. This makes it easier to expel. Doctors might tell you that you really need to take an industrial-strength chemical laxative because psyllium husks only begins to work after you have taken it for two or three months, but that's a misunderstanding. 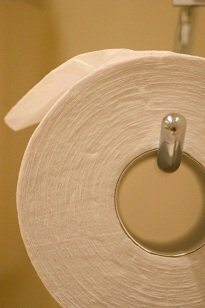 Are you consistently constipated? Perhaps… you need to replenish the beneficial, or symbiotic, bacteria in your gut. It takes 2 or 3 months for you to build up enough bacteria to start using fiber as their food. When bacteria feed on fiber, the bacteria themselves start to fill up the colon, and bacteria are easy to eliminate. These symbiotic bacteria do not cause disease. In fact, they treat constipation and make vitamin K! If you don't have the bacteria in your system, taking psyllium fiber or any other kind of fiber won't do you a lot of good. If you do have fiber in you colon, however, as little as 3 grams (less than a teaspoon) of fiber a day is enough to achieve regularity in just a few days. #1 - The soluble fibers in psyllium husk powder relieves the alternating constipation and diarrhea, as well as bloating and gas, common in irritable bowel syndrome (IBS). The insoluble fibers in bran often make IBS worse, especially at the beginning of treatment. #2 - Regular consumption of psyllium supplements slightly reduces bloodstream concentrations of a clotting factor known as fibrinogen. Fibrinogen, as it name suggests, turns proteins into fibers. These fibers become a net that "catches" clots that then clog arteries. In obese individuals, modest reductions of clotting factors may reduce risk of heart attacks and stroke while creating danger of spontaneous or excessive bleeding. #3 - Higher consumption of psyllium is associated with lower mortality from colon cancer. A neat benefit of psyllium fiber, due to its bulkiness, may be its ability to satisfy your appetite. We all know, for instance, that a blueberry smoothie recipe is a great source of antioxidants, but it usually doesn't fill you up for very long. If you add psyllium husk to your smoothie, it does. #1 - A decrease in ghrelin after you eat your meal. As Dr. Oz puts it, "If your stomach is yellin', you have too much ghrelin." Higher levels of this hormone signal the brain that the stomach has not yet received enough food. Lower levels of this hormone signal the brain that the stomach is full. These positive psyllium side effects result from the stomach's sensation of the consistency of the food. So, taking psyllium fiber in capsules would not have the same effect. Psyllium fiber imparts a thick texture to smoothies that regulates two different hormones that keep you from getting hungry. It speeds the movement of digested food through your digestive tract. It enables you to absorb less fat from your food. Psyllium husks makes smoothies more satisfying. It's important to understand that this is not about using psyllium capsules, it is about using powdered psyllium you can buy at grocery stores in the bulk supplements counter or at herb shops. Don't use orange-flavored Metamucil! And it's also important to understand that the psyllium husk powder you use must be thoroughly blended into the smoothie. Make sure to never take psyllium fiber without fluid, at least 8 oz (240 ml) for every scant teaspoon (2 g) of the psyllium husks. You also need to drink water if you take psyllium capsules, at least 1/2 cup or 120 ml of water for each 1 g capsule. As long as you limit the amount of psyllium husks in your smoothie to a single, level or scant teaspoon, you don't need additional fluid. More psyllium is not better. Just a little psyllium fiber is enough to make the smoothie satisfying and regulating for your digestive system. For an average 2-3 cup smoothie, you can use about 1 teaspoon - 1/2 tablespoon of psyllium husk powder. Don't have any psyllium in your pantry? Buy psyllium at mountainroseherbs.com at a low price. Bijkerk CJ, de Wit NJ, Muris JW, Whorwell PJ, Knottnerus JA, Hoes AW. Soluble or insoluble fibre in irritable bowel syndrome in primary care? Randomised placebo controlled trial. BMJ. 2009 Aug 27;339:b3154. doi: 10.1136/bmj.b3154. Juvonen KR, Purhonen AK, Salmenkallio-Marttila M, Lähteenmäki L, Laaksonen DE, Herzig KH, Uusitupa MI, Poutanen KS, Karhunen LJ. Viscosity of fiber-enriched beverages influences gastrointestinal hormonal responses in healthy humans. J Nutr. 2009 Mar;139(3):461-6. Epub 2009 Jan 28. King DE, Mainous AG 3rd, Egan BM, Woolson RF, Geesey ME. Effect of psyllium fiber supplementation on C-reactive protein: the trial to reduce inflammatory markers (TRIM). Ann Fam Med. 2008 Mar-Apr;6(2):100-6. López JC, Villanueva R, Martínez-Hernández D, Albaladejo R, Regidor E, Calle ME.Plantago ovata consumption and colorectal mortality in Spain, 1995-2000. J Epidemiol. 2009;19(4):206-11. Epub 2009 Jun 27. Johanson JF. Review of the treatment options for chronic constipation. MedGenMed. 2007 May 2;9(2):25.